"Working with Elisheva as our wedding planner was one of the smartest decisions we made in the wedding planning process. She saved me so much time with her outstanding vendor recommendations and connections within the industry. In addition, everyone she recommended was equally as sweet and talented as she is which allowed us to assemble a terrific team who made our wedding day absolutely spectacular. We also appreciated her creative insight which helped enhance our vision for the wedding. Our guests raved about how beautiful everything was and the amazing attention to detail we had at the wedding and much of that was due to Elisheva's suggestions. The day of the wedding I didn't worry about anything because I knew Elisheva would make everything run smoothly and everything did. Lastly, I would like to thank Elisheva for her friendship throughout the whole process. 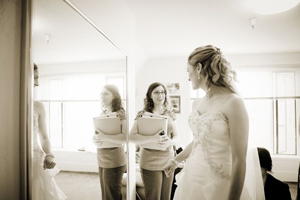 She is a genuinely warm person who truly cares about making her clients' wedding days a dream come true. - Kristen Brunson"
"I want to thank you for the most beautiful wedding I have ever attended. I felt so guilty for not being in California to help my daughter and you worked with her to plan her dream wedding. Everything was perfect! I watch the slideshow daily and relive it - yes, with tears! I am so happy for her. I wish I had another daughter to experience another fantastic wedding. Carolyn Brunson - Kristen's mom"